It’s been a long time since I spent any time in Resident Evil 2’s zombie-infested Raccoon City, and I was eager to get back. So much so, that I spent much of what was supposed to be a busy weekend rushing through work and neglecting sleep to spend as much time in the shoes of protagonists Leon Kennedy and Claire Redfield as possible. There are enough changes here to easily justify the purchase, even if you have been revisiting the original game and its various remakes for years. Surprisingly, the story adheres to the beats of the original, adding in a few extra details to better slot the game into the overall series mythos. There are, however, some changes, and Leon’s original depiction as a heavy drinker has been entirely omitted. I also got a different sense of his personality than I originally did, where he now is better cast in the role of a naïve rookie. He comes across as duty-bound, lawful, and clean cut, whereas in later games he comes across more as a gruff badass. This contrast wasn’t present in the original version of Resident Evil 2, where Leon hardly had a personality at all, and it is a powerful example of how his experiences change him. 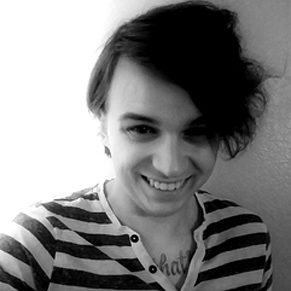 The new voice actor and Leon’s new look help contribute to this feeling almost as much as the writing. The way in which the story unfolds will be especially familiar to fans of the series. The narrative is a mixture of traditional cutscenes with epistolary storytelling wherein players can, to whatever degree they want, explore the various locations in search of documents and photos to get a more fully developed impression of various characters and events. In this way, the story of Resident Evil 2 is a puzzle in itself. This makes sense, because puzzles are at the heart of Resident Evil 2. The whole game is, essentially, one giant puzzle waiting to be solved sort of like a gigantic, atypical escape room chocked full of people trying to kill you. Most are hosted within the dreary, pseudo-Victorian halls of the police station. It is highly satisfying to acquire puzzle pieces at unexpected moments. Often I’d wrestle with a riddle, unsure of where to even begin looking for the solution, but there are fortunately so many puzzles to solve that sequence isn’t always important. As a result, there’s a freedom in roaming the game. For people new to the series or those whose memories are a bit rusty, there might be a degree of frustration. I experienced this consternation as well, but it was immediately alleviated when I was reminded that examining items in your inventory is important. Turning them about allows the player to interact with some of them. It’s often simple stuff, like removing a jewel from a scepter, but it’s important to keep this knowledge at the forefront. It’s also important to look at the map, because rooms change from blue to red when they are solved and fully raided for items. Fans of the Metroidvania genre will be familiar with this sort of gameplay. Capcom didn’t shy away from forcing you to travel great distances to revisit an earlier puzzle. It’s akin to acquiring a weapon to unlock a part of the map in a Metroid game. I do not know how I never made this connection before, but I can now fully recommend that fans of that genre take a dip into Resident Evil 2. The game also does an amazing job of cultivating atmosphere and, at times, outright horror. Almost every tactic of scaring the player is present here. The sound design is particularly impressive, because it commands the players attention. Noises come from above,to the side of you, and behind you. The goal, presumably, is to bait the player into looking. The paranoia comes from the few times you look in the wrong direction, which cultivates an idea that the game is trying to trick you. Resident Evil 2 is full of tricks like this. At one point, before rounding a corner, I noticed the shadow of a woman cast upon the wall. My body grew tense as I peeked around the corner, but I saw nothing. Upon further examination, I discovered the source of the shadow was a small statue on a desk with a lamp behind it. Jump scares are effective as well because, typically, they aren’t just a loud noise or a shocking visual. Instead, they pose an actual risk, so diligence is encouraged. This also means that, even in long quiet stretches, the tension is maintained. 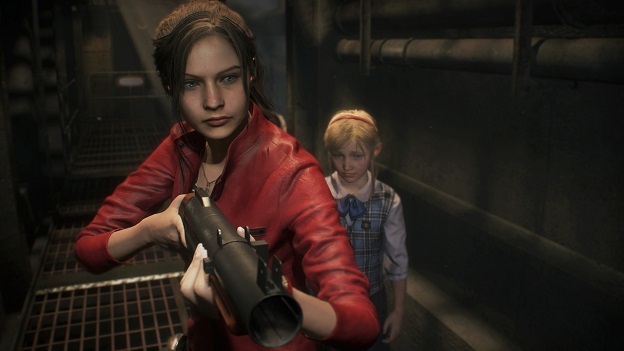 Bad things can happen at any time in Resident Evil 2. Later in the game, there’s a reason to feel stalked, although I won’t give that away at this point. It’s not all quiet tension, though. The game has its fair share of breakneck action sequences. Many times, in my search for items, I’d run out of bullets. As a result, I couldn’t effectively fight zombies, so I had to make a mad dash past them to attain what I needed. The trouble is that zombies are adept at grabbing ahold of your character. If difficulty is an issue, players can turn on something called assist mode. There’s no shame in this for beginners and, when I tried it, the game remained both enjoyable and challenging. It’s a relatively simple change, too. All it does is replenish the players health over time, bringing you back from the precipice of death into the yellow zone that often, is only two hits away from death. In a game that puts a heavy emphasis on resource management, this might be appreciated even if it isn’t the difficulty isn’t a hurdle for you, as some people just hate managing their items. The assist mode also helps with aiming. The biggest help, I found, though was increasing the brightness of the game. I know that this is sacrilege in some circles, but Resident Evil 2 is particularly dark in places. A modicum of glare can ruin the experience. Some people also just don’t have the eyes for that kind of thing, and washing out the game certainly decreases difficulty at the expense of atmosphere. 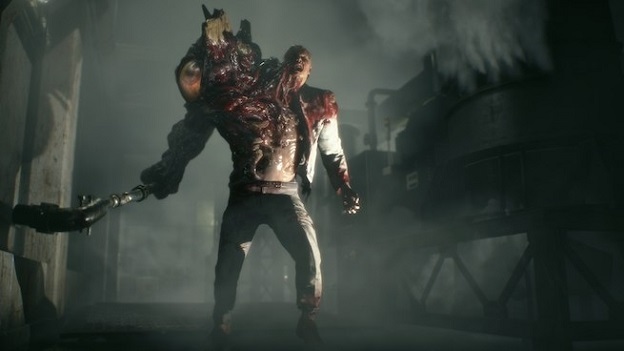 Even washed out, Resident Evil 2 looks good, somehow. The game also eschews the “tank” controls of the original. These tank controls were, as the namesake would suggest, akin to driving a tank. Pressing forward made the player move forward relative to the direction the were facing, while pressing left or right would rotate them. It wasn’t the most intuitive thing in the world, but it did create a sense of impotence that added to the more horrific elements. This game uses a control scheme closer to the one developed for Resident Evil 4, which puts the camera behind the characters shoulder and utilizes blind spots to create a similar sort of anxiety. At no point does the game feel like a typical action shooter and, until you upgrade your guns, you don’t really get a sense of being powerful. 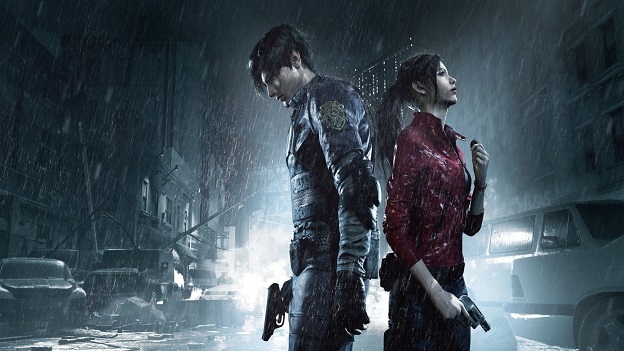 This remake is, without a doubt, the best way to experience Resident Evil 2. Not only is it graphically and mechanically superior to the original, but it contains new content and better characterization. This is especially valuable, as the original hasn’t aged well and its control scheme is more of a novelty that’s worth checking out. I’ll also make this claim: it is no longer a given that the often exalted Resident Evil 4 is the best Resident Evil to date. I’ll gladly argue with anybody who is willing that Resident Evil 2 is better. It is my hope that this debate lasts until the next Resident Evil game that, if Capcom is smart, will use this nearly perfect game as a guideline. A spine-chilling reimagining of a horror classic - Based on the original PlayStation console release in 1998, the new game has been completely rebuilt from the ground up for a deeper narrative experience. 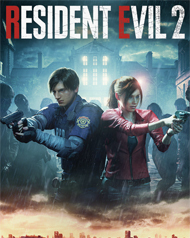 A whole new perspective - The new over-the-shoulder camera mode and modernized control scheme create a more modern take on the survival horror experience and offer players a trip down memory lane with the original gameplay modes from the 1998 release. 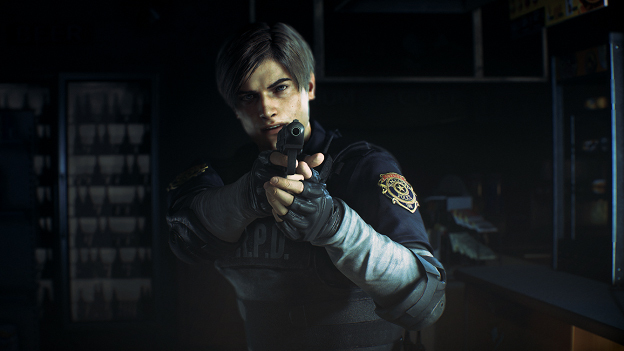 See favorite characters in a whole new light - Join rookie police officer Leon S. Kennedy on his first day on the job and college student Claire Redfield, who is searching for her brother amidst a terrifying zombie epidemic.